Benjamin got a pair of the Fringe mini farmers walk handles to add to his sweet garage gym. These have the same advantage of the larger sized “top load” style farmers handles where the plates don’t have to touch the ground when you load them. You can drop it on its side. 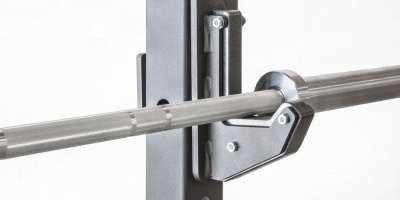 That makes it easier to load weight without having to slide plates on the ends like the farmers carry bars that are shaped more like a traditional straight barbell. How much weight can you fit on them? With bumper plates, depending on the model of bumpers as Benjamin shows, you may be able to load each handle up to 123 lbs (115 lbs + 8 lb handle). That’s the case with the Rogue Echo bumpers. The Troy VTX bumpers, which are a bit thicker, you can load them up to 98 lbs (90 lbs + 8 lb handle). Think about how easily (or not) you can pick up a 100lb pair of dumbbells and walk around with them. Not so easy to hold onto unless you’re used to deadlifting over 400 lbs. Don’t worry about these mini farmers handles limiting the amount of weight you can fit unless you fall into that category. With iron plates, even exceptionally strong people won’t ever run out of space. You’re talking hundreds of pounds. Remember, it’s one thing to lift it. It’s another to keep holding on to it and walk around with it. Try doing this with even half of your max deadlift and you’ll find it hard. Like deadlifts, farmers carries are one of those exercises that work muscles throughout your whole body. Farmers carries are actually best done as a unilateral exercise. This is a fancy way of saying “one hand at a time.” With both hands at once, you’re not making it twice as hard; you’re really taking away a large portion of the muscular involvement in keeping your balance while carrying a heavy weight on one side. Try carrying it one-handed for a long distance, then switch hands to balance it out. Finally, you can also do shrugs with these, which are best done as a bilateral movement. Do they look like what you need? You can get these direct from FringeSport.